Top seeds Samoa and Canada suffer surprise losses to Ireland and Germany on day one of the Olympic repechage event in Monaco but remain in the hunt for the final men's place at Rio 2016. Ireland and Germany produced exceptional performances on a pulsating opening day of the Monaco Sevens to shock the top seeds and earn a place in the Championship Cup quarter-finals. With a place at Rio 2016 at stake, Germany defeated HSBC Sevens World Series core team Canada 21-19 to complete a clean-sweep of three victories and top Pool B, while Ireland dispatched HSBC Paris Sevens winners Samoa 27-21 to finish undefeated at the top of Pool A.
Russia and Hong Kong were the only other undefeated teams, topping Pool C and D respectively, while Samoa, Canada, Morocco and Spain progressed as runners-up to set up a fascinating quarter-final line-up. With their Serene Highnesses Prince Albert and Princess Charlene in attendance, a place at Rio 2016 at stake and a vibrant and highly-engaged crowd bathed in Mediterranean sunshine, day one certainly lived-up to all expectations. The teams that finished third and fourth in their pools progress to the second tier Challenge Trophy on Sunday. Drawn in a tough Pool A with Samoa, Zimbabwe and Tonga, the Irish tore up the form book to defeat tournament favourites Samoa 27-21, along with Zimbabwe 24-12 and Tonga 31-12 to top the pool standings. Samoa progressed to the quarters as second-placed team. Ireland captain Tom Daly said: "We are delighted with how we have progressed. We came here with expectations of qualifying for the Cup quarter-finals and that's what we have done. 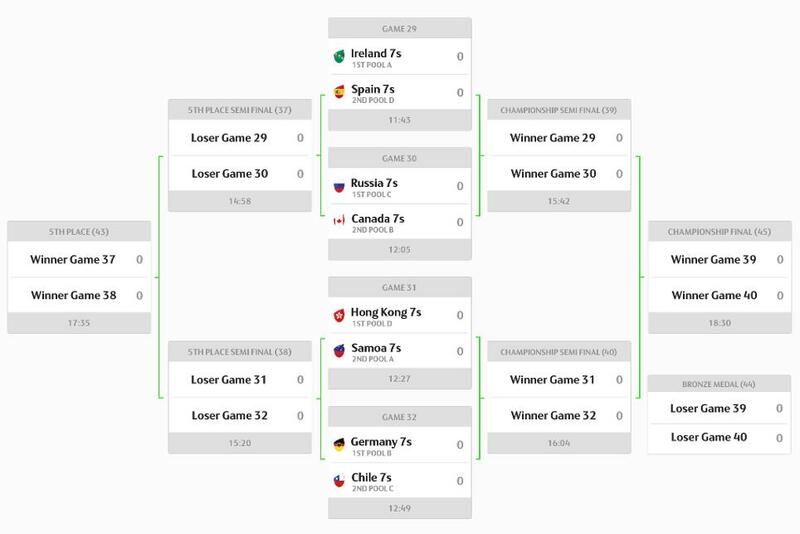 Germany saved their best to last, defeating Canada 21-19 in the winner-takes-all match at the top of the Pool B table. The Germans had opened their account with a 42-5 win over Sri Lanka and followed-up with a 22-14 defeat of Uruguay. Despite missing out on the top spot, Canada's men will now need to regroup on day two if they are to join the women's team in qualifying for Rio 2016. Russia quietly made their way through to the Champions Cup quarter-finals as Pool C winners after seeing off a determined Morocco 26-19 with a final flurry, Tunisia 24-12 and Chile 26-0. As runners up, the Chileans also take their place in the cup quarters. Hong Kong, aiming to be the second Asian side in the men's competition at the Games, also made impressive progress, defeating a spirited Mexico side 26-10, South Korea 19-7 and Spain 19-0. Spain, who won their two other pool matches, also progress. Tom McQueen said his Hong Kong side are relishing the opportunity to play Samoa in the cup quarters. "It was great to come through undefeated and that was our objective. We have Samoa tomorrow and that will be a tough match, but we can't wait to get out there."